These entries tell you about events I have participated in will participate in. Medical Students: What Do They Want To Know? Below is my post from 2010 about my presentation to UCLA Medical Students in the Primary Care College. Today, I repeated my lecture on ‘Psychiatric Emergencies’ , with the addition of a narrative about the wonders, and not such wonders, in DSM 5. I changed my presentation style, but not my content. I moved my body in front of the podium. I walked up and down the aisles, making me feel like a rock star, moving into my audience. I made eye contact with each student. Only one person fell asleep. This, being 2013, most of these students were female, young, and enthusiastic. I arrived an hour early, so I could hear the lecture before mine. I learned that the Affordable Care Act is going to focus on patient satisfaction, public health and cost-efficiency. As such, pediatricians will, in all likelihood, not do ‘well-child checks’ as this can be done by nurses. Pediatricians, like in many countries around the world, will be specialists, referred to after the Family Medicine doctor gets stuck. Most doctors will not be self-employed. They will work for large systems of care, like Kaiser. Specialists will have trouble finding jobs in areas they want, as they will need to be “deployed” to where the need is. Primary care will be in demand. Loan repayment was the largest area of discussion. Most students are saddled with large debt. The rate they pay it off, and the type of job they get are influenced by their tolerance to handle such demands. Once again, I found myself in a field that is rapidly changing, feeling like, although I sat in those same chairs, thirty years ago, I cannot connect with the experience of the current students. They are entering in a world which is evolving so quickly, that they do not know what their world will look like when they finish their training, five or seven or nine years from now. There was then a ten minute break which, quite cleverly, I thought, the physician-coordinator, told us that it was time to do our exercises. All fifty of us got up to do a series of dance steps, swinging our arms and legs, while this physician reminded us that physical exercise will help us concentrate. She transformed from Professor to exercise guru. It was cool. I began by asking how many students were interested in psychiatry. Three hands went up, but the coördinator reminded me, that primary care has a lot of psychiatry. Yep, I knew that. These are new fourth-year medical students, about to apply for the “match,” meaning they had to rank order their list of residency programs that they were interested in. This is a major crossroads in their lives, and although I don’t know these students intimately, most of them, seemed quite relaxed about their education and their future. I proceeded to talk about the management of a psychiatric emergency, reminding them that there are no objective tests, and so, all of psychiatry relies on informed intuition, based on a thorough history and good mental status examination. I talked about the importance of learning to listen to the patient’s narrative, as listening provides information for a diagnosis, but it is also therapeutic. I reminded them that psychoanalysis helps train people to listen, and so they could consider psychoanalytic training, regardless of what field of medicine they chose. One student after the class, told me they were indeed interested in psychoanalysis. I felt relieved. Listening is not dead in medicine, at least not completely dead. What is the Primary Care College? stimulate discussion of new findings in the basic, social, and clinical sciences relevant to the future practice of medicine. College activities include an introductory course focused on advanced clinical skills and decision making, a monthly series of evening seminars, a longitudinal academic activity that can be either teaching or scholarship, and regular advisory meetings. Academic Medicine — Careers that will include research or subspecialty training programs that require research. The theme is the development of skills in basic and clinical research. Acute Care — Careers in emergency medicine, anesthesia, and critical care specialties. Themes include time-based decision making, physiologic correlations, and crisis management. Applied Anatomy — Careers in the various surgical specialties, obstetrics & gynecology, radiology, radiation oncology, ophthalmology, and pathology. The unifying theme is anatomical implications in medical practice. Primary Care — Careers in internal medicine, pediatrics, family medicine, obstetrics & gynecology, and psychiatry. Themes include prevention, mental health, international health, geriatrics, and women’s health. Drew Urban Underserved — Members of this college are students in the combined UCLA/Drew University program, which is recognized for its placement of graduates in underserved communities. So, I am thinking about how I am going to warm up the audience for the Q and A session. This is my five minutes to have the Broad Stage to myself-a bit daunting, I must say. Then, Dr. Freud and Professor Lewis, aka Judd Hirsch and Tom Cavanagh join me. The tension is mounting as I think about it. How I present myself will be in the collective memory in the five hundred members of the audience. I think serious preparation is in order. Here are my initial thoughts. Although the play is a point/counterpoint about one’s outlook on the world, it really represents two sides to the same issue. In many ways, Professor Lewis is proposing the life is a half-full attitude in sharp contrast to Dr.Freud’s half-empty approach. Sigmund Freud in 1939, was dying a painful death from throat cancer, only one year after leaving his home in Vienna to escape the Nazis. Professor Lewis, 41, was thriving in his career as an Oxford Professor. For ninety minutes, in this fictional play, they argue over whether there is a benevolent figure who guide our lives, or whether we, as individuals are responsible for our own destiny. Both ideas can be true. Moreover, as so much of what we say is projection, we really hear one man who has found happiness, Professor Lewis, in contrast to another man who is struggling with not only his own death, but the mass destruction of his fellow Jewish citizens. Perhaps each one speaks to their own internal world, disguised in what sounds like a prescription for how we, the audience, should live our lives. Now, the actors come on stage. 1. Mr. Hirsch, I noticed you were a physics major in college. 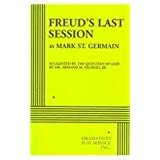 Is there a possibility that the science of physics attracted you to playing Freud, who thought of himself as a scientist? 2. Mr. Hirsch, I remember you when you played the psychiatrist in ‘Ordinary People’. Now, you are playing Freud. Do you find an interesting connection there? Now, I want to think of questions for Mr. Cavanagh. Maybe I need to watch “Scrubs”. 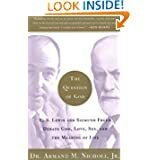 This book, by Dr. Nicholi, is the basis for Mark St. Germain’s play “Freud’s Last Session,” in which, as per previous post, I will be one of the “Talkback” speakers. In preparation for my début, I have given myself homework to read this book and watch the PBS series of the same title. I have also purchased the script of the play (available for $8.00 on Amazon), that I plan to read after I have done my background exploration. 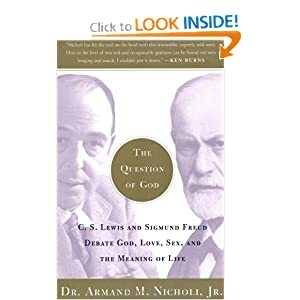 I will continue to post as I read this book, but my first fear is that Dr. Nicholi has made Freud’s view on religion more central to Freud’s contribution than his theories related to the process of mining the unconscious. 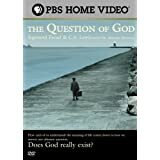 If lay people walk away from this play thinking that Freud was set to make people atheists than they will miss the point that Freud’s theory on religion fit into a much broader theory of the human mind. One does not have to accept Freud’s ideas about religion to gain from his ideas about self-sabotage and the primacy of one’s parental relationships. Likewise, I suspect that C. S. Lewis has brought us far more than his views on religion. His writings are so prolific that it would be sad to think of him only in these terms. Maybe this will be my opening statement. I will have less than five minutes to introduce the “Talkback”. I will probably spend hours thinking about those five minutes. Time well spent, meaningfully spent, I should say, given the gravity of this topic. Saturday, February 9, 2013 8:00 pm show at the Broad Theatre…I will be doing a Talkback after the performance. Wanna come? Calling My 232 German Friends…. I am looking for teaching opportunities in Berlin. Any ideas? This is not the group I spoke to today, but the picture gives you an idea of psychiatry residents, physicians who decided sometime in their medical career to specialize in psychiatry. These folks, graduates of medical school, have decided to spend four years doing adult psychiatry training and they can then decide to add-on another one to two years to do child psychiatry training. At a noon-time talk, we discussed why I did psychoanalytic training and whether it makes sense for them. “I felt when I finished my adult residency and my child psychiatry fellowship that I needed more psychotherapy training.” I said to astonished faces. “After all this training you did not feel competent?” One resident asked me. “First, you have to remember that I trained in the eighties where we had a lot of psychotherapy training in residency and we did not have as many psychopharmacological tools, which means that we did not have psychopharmacology clinics like you have now.” I say, emphasizing that doing psychotherapy in residency made me appreciate the depth of knowledge necessary to do deeper work, such that more training seemed mandatory to me. On the one hand, I understood that from their perspective, they are about to graduate from ten years of education, many of them saddled with substantial debt. The idea of further education must seem both financially and academically absurd. On the other hand, the work of a psychiatrist/psychotherapist can be so deep that training is never finished. This is a field of ongoing in-depth analysis of the human mind, which requires expert consultants, ongoing study, along with group training experiences to fully appreciate the nuances of motivation. “The end of residency is not the end of learning,” I say to a group that continues to look stunned. I am left to reflect on my own classmates in residency. We knew that psychoanalytic training was in our future. We accepted that as part of our professional development. Psychopharmacology was a nice addition to our tool box, but it was no substitute for studying how the mind navigates a complicated world. I fear that my cohort is a dying breed. “The one thing I am sure about is that I cannot be replaced by a computer.” I say with confidence. “Oh yes, you can” the residency director says. “One day a computer will study your every move and then be able to do exactly what you do, except that you keep learning and the computer cannot do that,” he corrects himself with a good point, supporting my point. Psychoanalytic training, as a lifelong process, makes my work deepen with time. Each patient adds to my experience and my wisdom, along with consultation with colleagues and study groups, such that replication of my work is nearly impossible. “I work in a personalized way and I am grateful for that opportunity,” I tell the residents. “No one else thinks like I do, and so I bring something unique to each session,” I say, without modesty, emphasizing the privilege of being a psychiatrist. I am not sure these residents will be able to say the same thing, but I sure hope they will. Worried is Not Well: Pri-Med: Happening Again…Wanna Come? “The young woman is looking for some sort of control over her life,” I say to fourth-year medical students, as a way to help explain the self-destructive behavior that might underlie Anorexia Nervosa. “What does she say when you ask her about how it feels to have control over her life by not eating,” an eager, soon to be primary care physician asks me. “Well, she would deny the experience. She would say that she does not have a problem; that her parents are overly concerned and they always have been. Her denial of her problem, stimulates a question about what is going on, on a deeper level of her brain. This leaves us, the clinician, to speculate that it is possible that on an unconscious level, there is a positive affirmation in her starvation, in her ability to control her bodily urges.” I say, wondering if these future physicians are looking at me glassy-eyed because they are tired or because I am not explaining the unconscious very well, or both. “So, what is a primary care physician supposed to do?” Another eager and enthusiastic fourth-year medical student, interested in Internal Medicine, asks me. “Well, as with so many complicated diseases, the primary care physician, needs to shepherd the patient through the health care system. The patient will need monitoring of her electrolytes, her weight, her blood pressure. She will also need to see a nutritionist, along with, a mental health provider. The primary care doctor needs to coördinate care; provide the patient with a “medical home,” the new buzz phrase. The student looks at me with recognition, maybe a little embarrassment that the answer was obvious, and yet because we are dealing with mental health issues, the clarity of the situation gets blurred. I am back to wondering my age-old question. Do medical students, our future physicians, need to understand human behavior? If so, what is the best way to teach them? If not, should their psychiatry curriculum be limited to psychopharmacology? My answer is clear. A major challenge in being a physician is to help people, help themselves. Understanding how patients get in their own way is critical to helping all patients stay on a good path. This seems both obvious and neglected. April 30, 2011….Medicines for the Female Mind….Anaheim, CA….